Absolutely gorgeous! Looks like a piece of art; Pendant is made of colored metals fused with glass.These eye-catching rectangular shaped pendants should be a staple in every jewelry box. They add a pop of color to any outfit to complete your look. These are handmade pieces so there may be some variations from the picture shown. 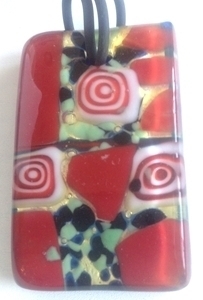 Murano Glass Rectangle Pendant of fused Murano murrine glass. (In this case it is called murrine since there is no "flower", rather abstract designs in the cane.) You can use a half hitch with your cord of leather through this hole easily. The back side has a slightly textured effect which it gets from sitting on the kiln fiber during fusing. The back of the red one is shown and the back of the silver/black is a black. They are made sandwich style, where the bottom layer sits on the kiln fiber shelf, and then the silver foil and a final toping of transparent clear Moretti glass. The fusing process takes the glass not quite to the fluid state and fuses the layers together.